Modified traps includes baseplate with D-ring, 4 coiled, 1/4" lamination. Offset is done with welded lugs to retain the smooth rolled jaw edge, no stamped offset with sharp edges. Features #3 music wire springs. 6" jaw spread. 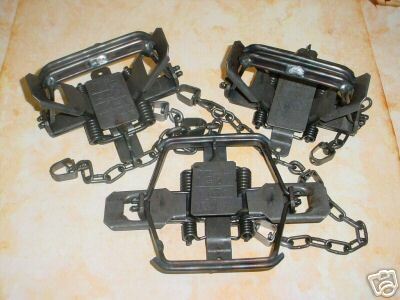 #3 straght link machine chain. Note: Additional shipping charges may apply to zip codes beggining with 7,8,9.